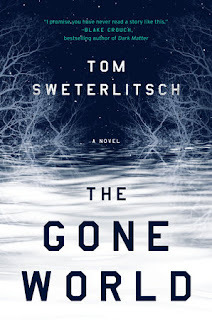 The Gone World by Tom Sweterlitsch is a highly recommended, intricately plotted science fiction/crime novel. In 1997 Shannon Moss is a federal agent with the Naval Criminal Investigative Service, NCIS, who is assigned to find the missing teenage daughter of a murdered Navy SEAL's family from southwestern Pennsylvania. When it is discovered that the murder has ties to personnel from U.S.S. Libra, a ship assumed lost during a top-secret space mission years ago, Shannon is sure that something the survivors encountered triggered the murder. She knows the mental-trauma of time travel since Shannon is an investigator that explores space and the future looking for clues to solve her cases. They are ever concerned about the ever-changing date of the coming Terminus, the date that signifies the end of humanity. Shannon travels ahead in time, to possible futures, seeking evidence to solve the murder case. This genre-bending novel satisfyingly integrates a strong procedural crime investigation with a time traveling science fiction plot. The views of the potential futures of the Terminus, are all bleak, nightmarish outcomes, which add an additional horror element to the story. There are additional science fiction elements that are best experienced as you are reading rather than in a review. This one is a mind-twister, but in a good way. The plot is complex, layered, and the timelines change, so you have to carefully follow the action and see what may happen and what changes as Shannon investigates the missing girl, which leads, in part, to her uncovering a terrorist conspiracy of huge proportions. The suspense builds as the complexity increases. There is an ever-present feeling of fear, that a threat is just around the corner. The characters are all well-developed and presented as individuals. The Gone World features smart, excellent writing. Sweterlitsch creates a dark, moody noir feeling in the bleak crime investigation. I appreciate that the crime investigation was an essential part of the story and the sci-fi elements didn't overtake it. There were a couple minor issues with it that prevented me from going with my top rating. One was the ending, which I didn't personally like. The others could be potential spoilers. Finally, the good news is that The Gone World is being made into a movie. This is one of those stories that will likely translate well into a movie and may be easier for everyone to follow along all the timelines in the action.